Just two days until the first Mariners spring training game! All About Lily Chou-Chou – A much longer film from director Shunji Iwai, who made the totally charming April Story (#5, 1998). A sprawling tale of seriously screwed up junior high school kids who escape into music and the internet to try to transcend the horrors of their everyday lives. The film is almost oppressively depressing, livened by some truly beautiful images and music, both of the fictional title technopop star (a seeming amalgam of Faye Wong and Björk) and Claude Debussy, from whom said star takes her inspiration. The image quality on the DVD netflix sent was subpar, which is a shame because I bet the film looks as good as anything made this century. The #6 film of 2001. Helvetica – A documentary about a font that encapsulates the entire history of late 20th Century art in its movement from modernism to post-modernism to wherever we are now (post-post-modernism?) Far more than any other documentary I’ve seen recently, it tells its story not with talking heads (though there are several of those) but with images: countless shots of the eponymous font in all its ubiquity, demonstrating both the fonts formal elegance and beauty and the ways it has come to dominate our visual landscape. The film does a fine job of straddling the line between the admiration for the font’s good qualities (which are also those of modernism in general) and condemning the bland uniformity its near-universal adoption has imposed. More than any documentary I’ve seen in years, this film changed the way I looked at the world: fonts, fonts everywhere. The #9 film of 2007. The Lives Of Others – Fine melodrama seemingly overrated by the uniqueness of its setting and the competence of its acting and director. Not a great film by any means, the plot, especially by the end, vaguely resembles Swiss cheese and the visual style isn’t especially interesting. I did like it better than Pan’s Labyrinth, but I don’t understand why Charlie Rose loves it so much. The #21 film of 2006. 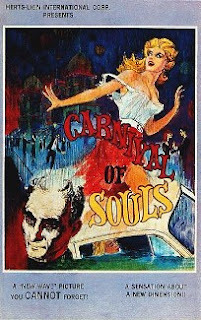 Carnival Of Souls – Having watched a number of low-budget horror films thanks to the television’s very fine TCM Underground series, I felt confident that what I’d get here was a cheap low-budget scarefest with slightly above amateur visual style and very bad acting. Instead, it’s a quite disturbing story that appears to have been filmed by Michelangelo Antonioni disguised with the unlikely pseudonym “Herk Harvey”. Seriously, not only are the creepy zombies scary, but the film’s resemblance to the films Antonioni was making at the same time, L’Eclisse (also from 1962) in particular, is rather frightening as well. they even seem to have used the same music. The acting is, for the most part, pretty terrible, though the lead even looks a bit like Monica Vitti. The #11 film of 1962. Passion – The first Jean-Luc Godard film I’ve seen from the 80s or later, it’s more or less the story of a film not quite being made. And like all Godard films, regardless of when they were made, the story is barely half the story. But even more than his early work, Passion is a collection of sequences, of beautiful, investigative shots tracking through recreations of moderately famous paintings, of actors acting up a storm whether we know what they’re talking about or not. In the end, it all makes a kind of sense. I look forward to watching this film again and again and again, as there’s no way I could possibly comprehend it one one viewing. The #4 film of 1982. Margot At The Wedding – I liked it and don’t see much difference in quality between it and Baumbach’s last movie, the much more highly acclaimed The Squid And The Whale (#13, 2005). Both are enjoyable, darkly comic films about totally insane people and their children. Neither is as good as Kicking And Screaming (#4, 1995), a personal favorite of mine. That film, liberated from Baumbach’s apparent issues with his parents, seems much more universally relatable than these last two quite specific films (he’s denied how autobiographical this one is, but it’s really hard to look at this any other way than a film by someone who needs to have a long talk with their mother). Both Nicole Kidman and Jennifer Jason Leigh were very good, but Jack Black was, at times, truly awful (though that may have been intentional). The #13 film of 2007. 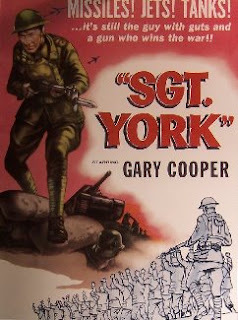 Sergeant York – Howard Hawks’s fine biopic about the backwoods pacifist who became a WWI hero by killing and capturing an exorbitant number of Germans. Despite the promise of the poster of “Missiles! Jets! Tanks!” the film spends most of its time showing York in the two years before the war, when he transforms himself from a drunken lout to an honest, hard-working citizen and his subsequent religious conversion (to say nothing of the fact that, aside from some rudimentary tanks, those things didn’t exist in World War I, belying the WWII propaganda purpose of the film’s advertising campaign, if not Hawks’s own intentions). The film doesn’t really feel like a Hawks film, the setting and story are much more in John Ford’s wheelhouse. Gary Cooper, who I’m not often a fan of, is very good in his Oscar-winning role as York, effectively capturing and making believable the characters many transformations. The #11 film of 1941. I’m glad you liked chou-chou. It’s a great film. I’m eager to revisit it and see how it holds up. It’s been a while since I last saw it. Oh, I recently saw Millennium Mambo. I didn’t like it as much as you but it was fascinating. I really enjoy the way Hou’s camera stays on one point but always seems to be moving. Great stuff.